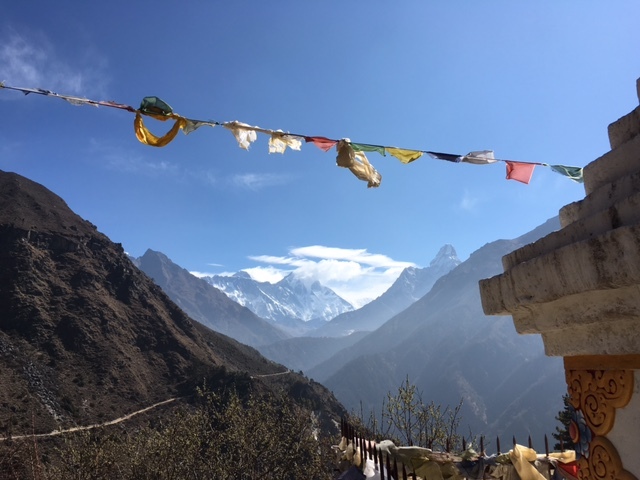 This was the view of Everest that greeted us as we rounded the corner from Namche. Three days in a row. It’s getting a lite closer each day. 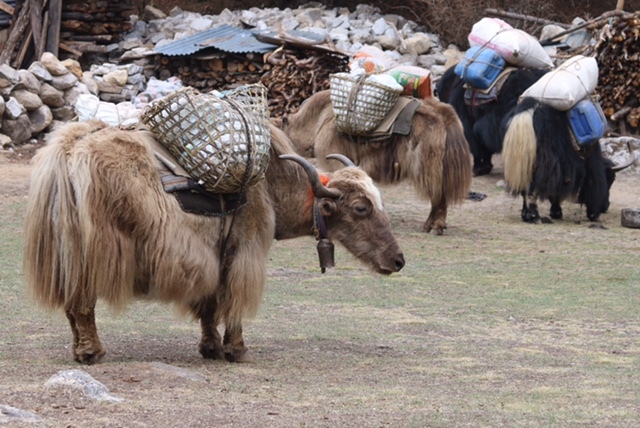 Everest was the biggest thing I saw today but I also saw yaks for the first time. Yaks are bigger and hairier that zhous. I also saw some small things. 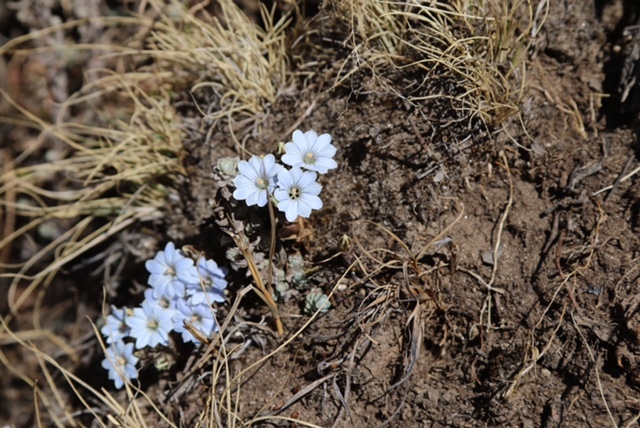 Tiny wild flowers and blooming rhododendrons dotted the trail. It’s dry this spring so it isn’t quite as colourful with wild flowers as some times but I enjoyed keeping my eye out for the small along with the big. 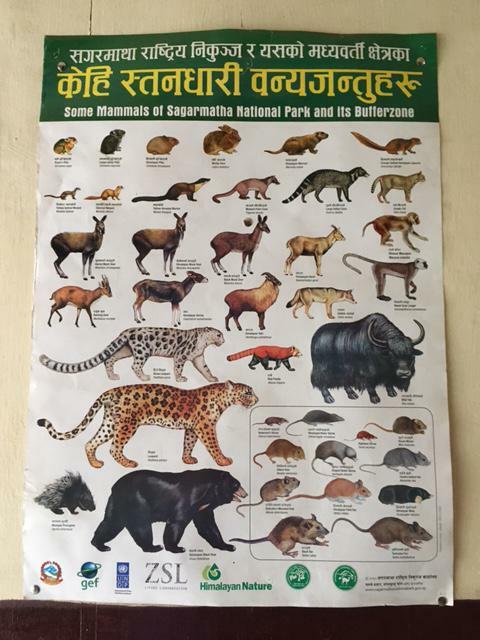 I know folks are often interested in the wildlife that we might see so I snapped this picture of a wildlife poster in our tea house. I haven’t seen any wild things yet but I have on other treks. Speaking of small things, Climber Smurf enjoyed the walk today as well. 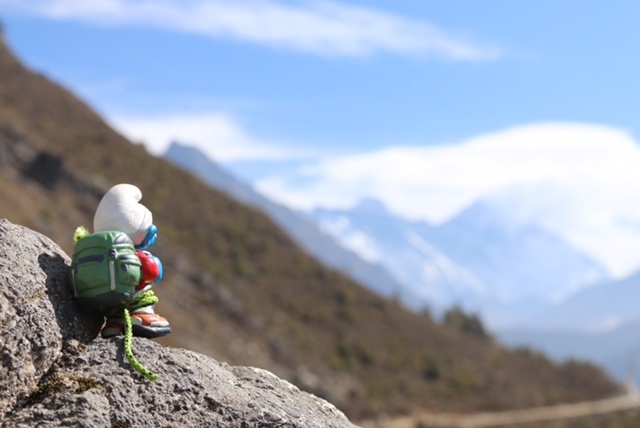 In this pic, Climber Smurf is enjoying a view of Everest. In my audio update, I mentioned checking out all the time zones represented by schools that are following along as well as team members. In case it was hard to hear…we have team members from Newfoundland, Connecticut, Minnesota, the United Kingdom, and Nepal. We have schools from Newfoundland, Labrador, Alberta, California, and North Carolina. That’s 10 times zones…how awesome is that? What are the names of all of those time zones? The Nepali word for time is samaya. 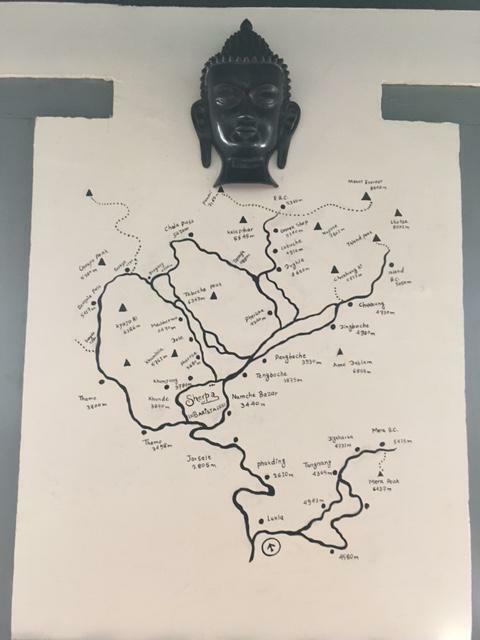 Here’s a map from a coffee shop. It has elevations of some of the places I mentioned in my audio update. The only place that’s not on the map is Phugitenga. Perhaps a little research will yield the elevation :-). There are many spellings of village names. 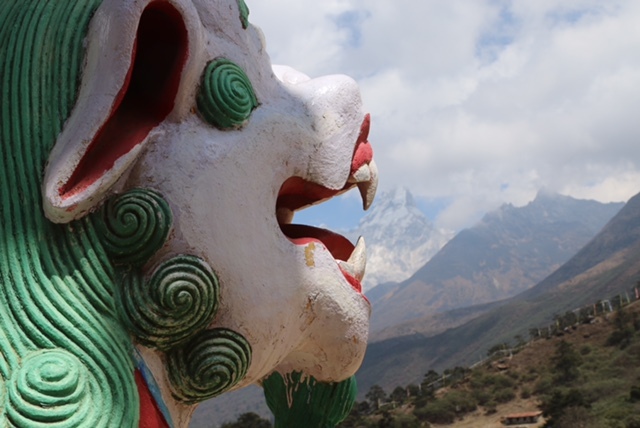 Finally, here is one of the Snow Lions guarding the entrance gate of Tengboche Monastery…it appears to be taking a small bite out of Ama Dablam. awesome…when do you leave for base camp? Then how long will it take (approx) to Summit? 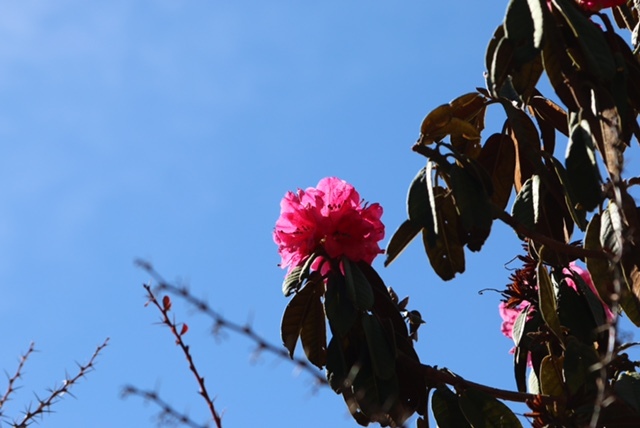 Thank you….following your journey is very interesting, inspiring and exciting. I spent a couple of hours today googling the maps Nepal, the towns/cities you have travelled to and especially of Mt. Everest from base camp to summit…..Trying to get a grasp of where you have been and where you are going. I was particularly interested in where Hillary Step, Balcony, South Summit and the camps are located. It was a quite a profound experience…following your posts, watching your videos and seeing your pictures has put this expedition on more of a personal level for me. Awesome!!! Thanks so much for coming along and engaging with Nepal.